The modern battlefield can change quickly from the confines of urban warfare to combat in open terrain or thickly wooded conditions. 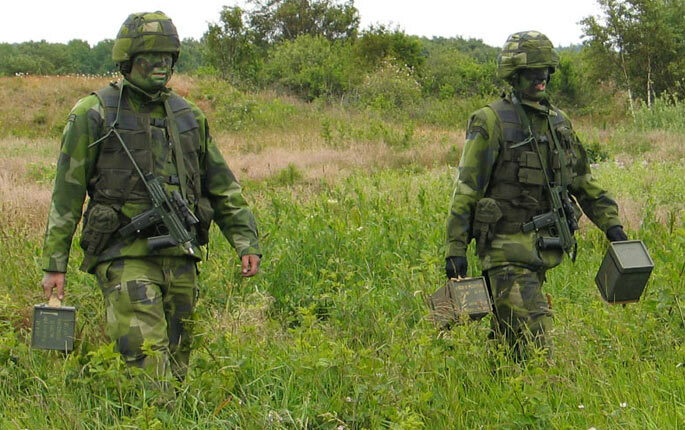 The soldier needs to carry more equipment than ever before without losing the ability to move and run, and the combat ranges often shrink to a few meters when fighting in built up areas. This drives the need for a smaller and lighter weapon, with increased firepower. 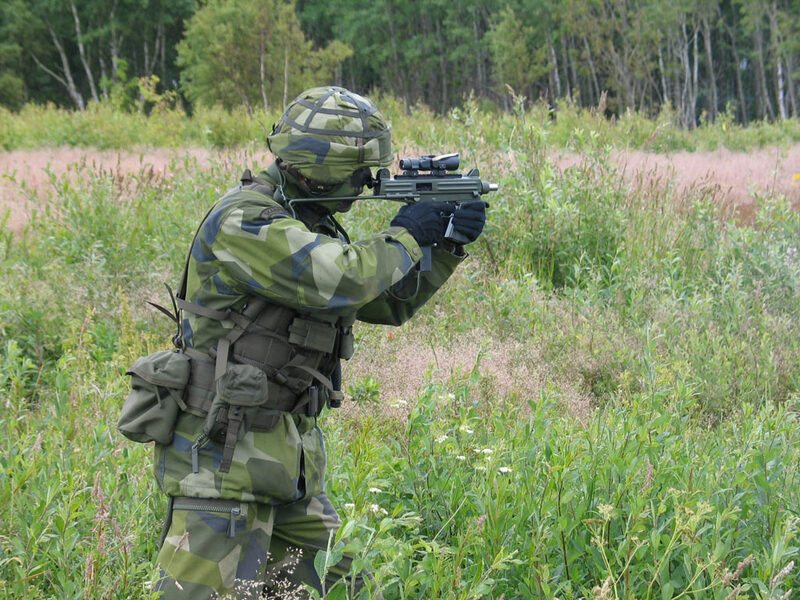 The CBJ Modular System is mainly intended as a Personal Defence Weapon and for Close Quarter Battle with users like Special Forces, SWAT, units specialized in urban warfare, Security Forces etc. It is very rugged and designed to fully function under the most harsh conditions from arctic to desert to jungle environments. 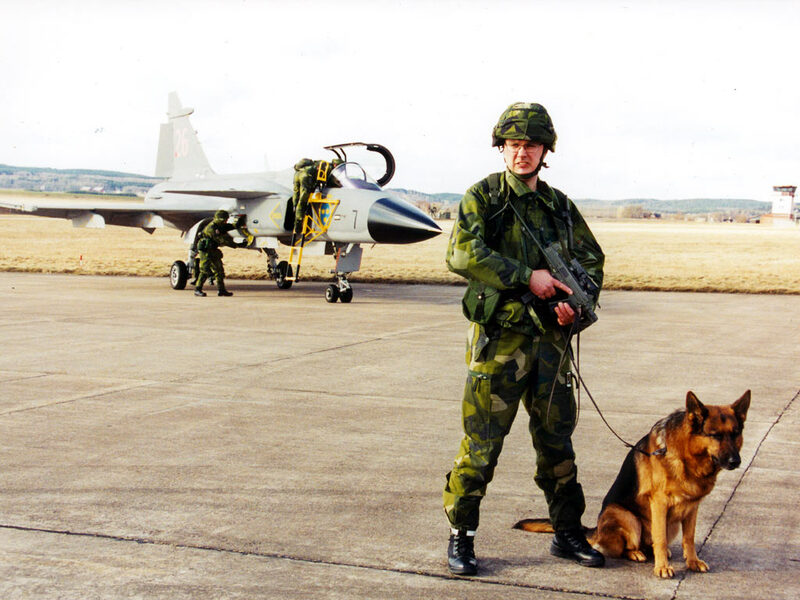 The weapon’s small size and low weight allows for prolonged carrying at high firing readiness. 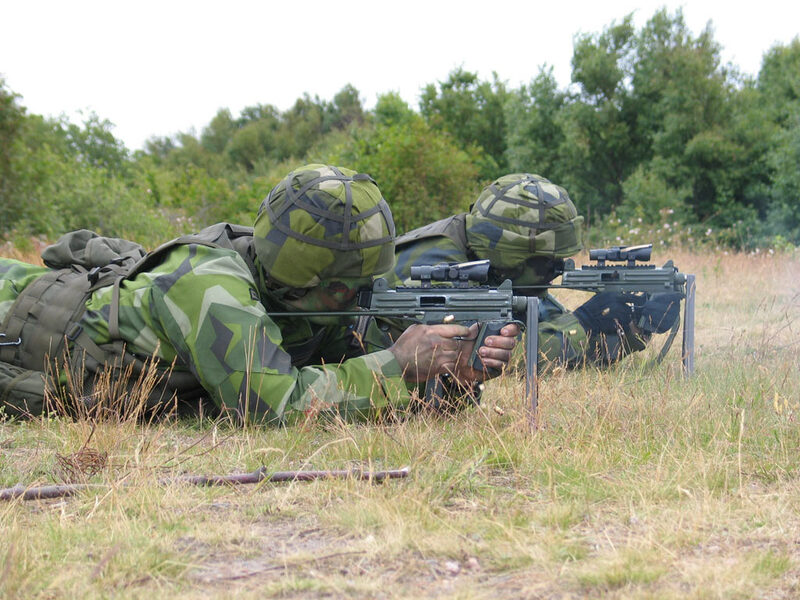 All normally tiring movements with the weapon at high readiness are simplified. 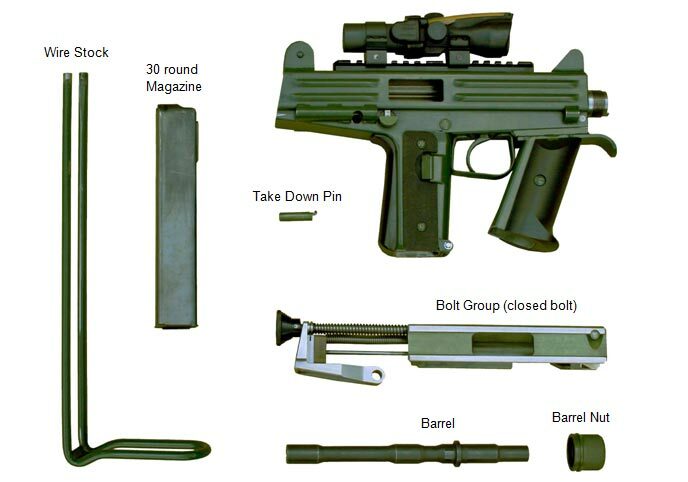 Good ergonomics and usability have been key demands during the development of the CBJ MS.
All parts in the weapon are made of stainless steel or polymers. This makes the weapon very resistant to corrosion, not only from salt water, but also from chemical agents used for decontamination. The weapon is blowback operated and fires from an open bolt. With a replaceable bolt group it can also fire from a closed bolt by help of a floating firing pin. The weapon’s good ergonomics, advanced priming ignition, low rate of fire and mechanical design of the bolt gives very good stability when firing, also at burst firing. The rugged simple design makes it extremely reliable. The CBJ Modular System can easily be equipped with most kinds of accessories like optical sights, bipod, tactical lights, case catcher, sound suppressors etc. None of these or other pieces of equipment attached to the weapon will conflict with handling or stripping. Different carrying slings (not shown in the picture) can easily be attached. For normal cleaning, the weapon breaks down in seven parts within seconds and without the use of any tools. The trigger housing with the front grip optionally still attached, can also be removed for easier access to the firing mechanism and the receiver, when a more thorough cleaning is needed. The receiver, including the lower receiver and the magazine housing, is formed from one single stamping. This part is shaped to ensure good stability even when a number of auxiliary pieces of equipment are attached. 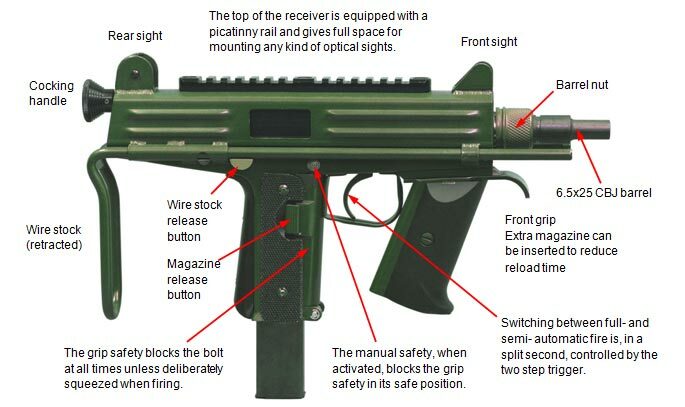 All important elements such as the barrel, sights, wire stock, magazine housing, and trigger mechanism are fitted to the same solid base – the receiver. 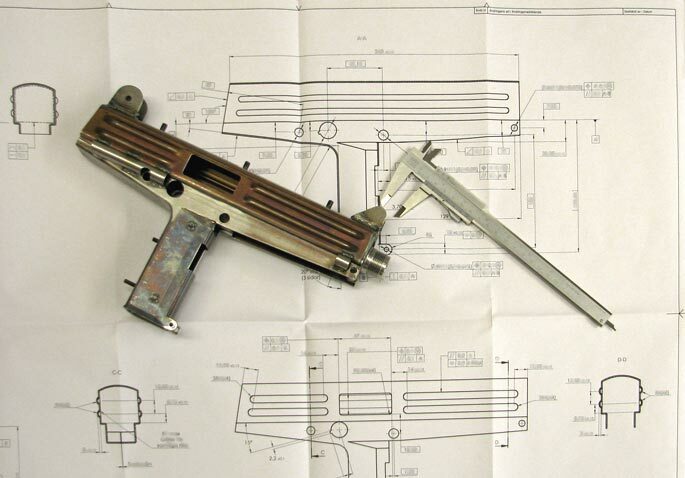 The receiver itself has no weakening groove for a bolt handle, which is common on conventional submachine guns. The receiver is well sealed and the bolt rides only on its four corners, leaving plenty of space for dirt, powder residues, etc., that may build up. This ensures full use of the weapon even in the most adverse conditions. 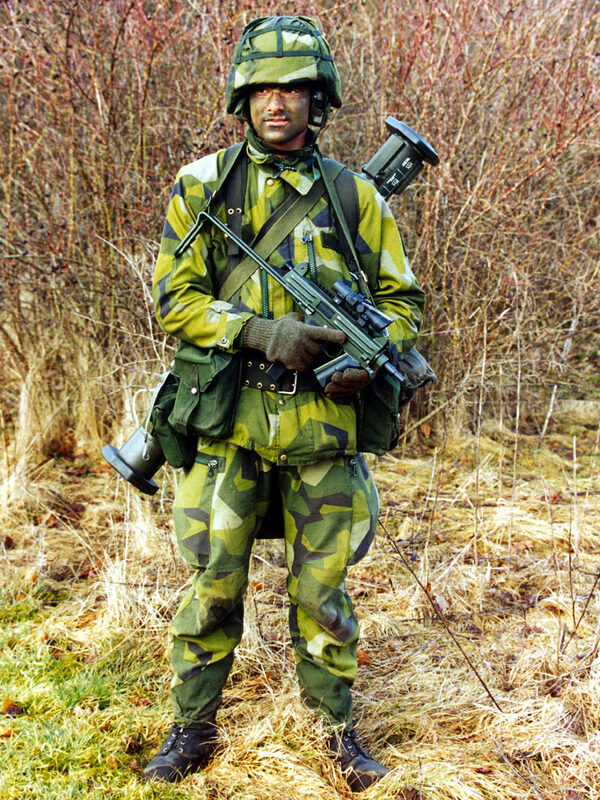 One important part of the weapon is the well reputed Carl Gustaf magazine, here well supported through the whole length of the pistol grip. The barrel is effectively supported in the receiver. This guarantees a retained point of impact whether or not the weapon has been taken apart. The grip safety, which forms the whole front strap of the pistol grip, is the simplest and safest to use, when compared with all other known models, and it acts directly on the sear that blocks the bolt in either cocked or forward position. The manually operated safety blocks the grip safety in its forward and engaged position when pushed to safe. The weapon can instantly and silently be unsafed with the shooting hand (left or right). The weapon can consequently be carried fully safe, but with a high degree of readiness. Cook off is completely eliminated as the weapon fires from the open bolt position (open bolt version only). The bolt, with its deeply recessed bolt face, surrounds the cartridge case effectively when extracted – a safety factor when there is a ruptured cartridge case. 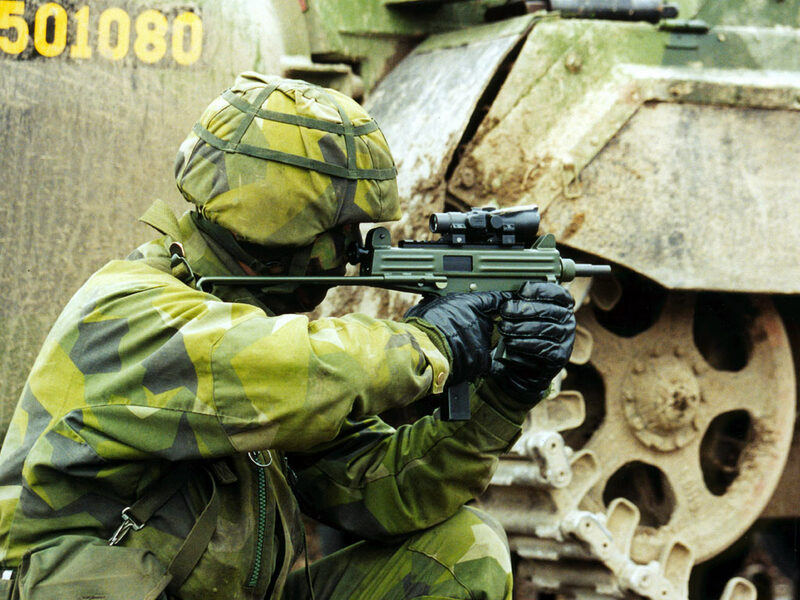 The weapon has no outside moving parts that can harm, snag or distract the shooter. This also means that firing cannot be prevented by an enemy gripping the receiver, as there is no conventional bolt handle to block. Switching between full- and semi automatic fire is controlled by the two step trigger. The first step gives semi automatic fire, and the second step full automatic fire. The weapon is easy to manufacture as the incorporated parts are made by modern production methods like metal stamping, investment casting, cold rolling of steel profiles, etc. 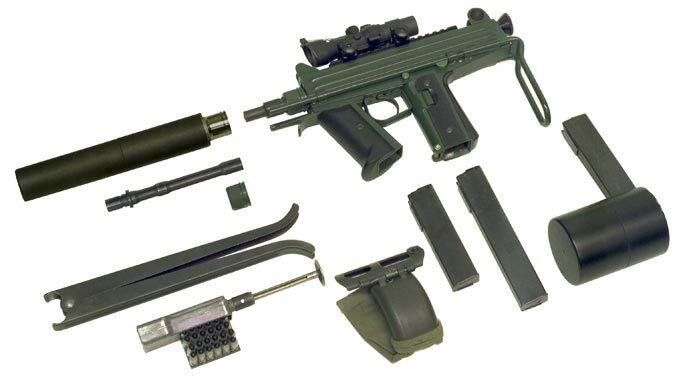 The weapon is easy to maintain as it is designed in modules and the parts are manufactured to such high tolerances that they are easily replaceable and completely interchangeable between different weapon individuals. Field stripping for cleaning or inspection can be done within seconds without the use of tools. The simple and efficient wire stock can be pulled out with a swift hand movement, and snaps automatically into position with help from the wire stock catch. It can also easily be taken out and used as a cleaning rod (only for 9mm Parabellum). The weapon remains very steady when fired, as it is well balanced, has a well adjusted weight, relatively low rate of fire and a deeply recessed bolt face. The symmetrical position of the sling swivels makes the weapon hang comfortably straight down on the chest or on the back, both for left hand and right hand users. With the wire stock retracted there are even more ways to carry it, like in the picture where it is holstered. The carefully designed grips help the weapon to fall into a natural aiming position. The front sight is adjustable for elevation and the rear sight for windage. All without the aid of any tools. The rear sight has three preset apertures. 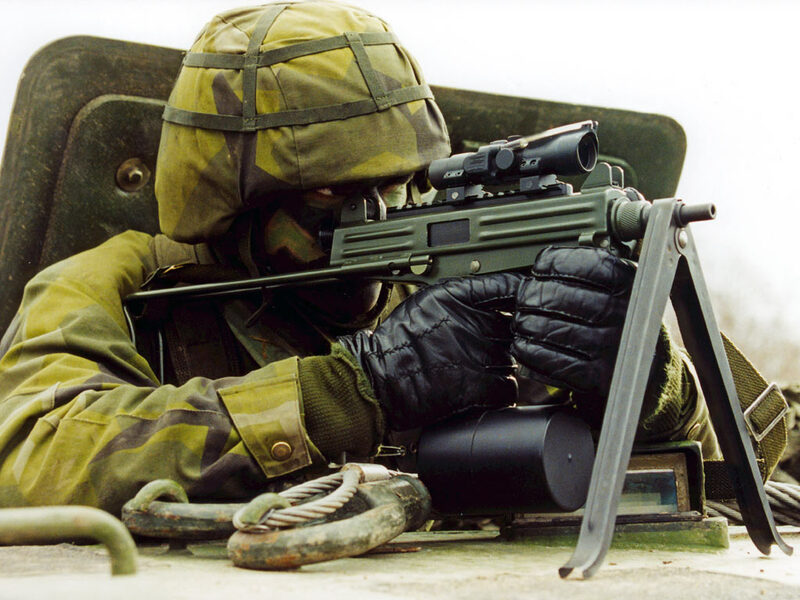 A Picatinny rail is fitted on top of the receiver, which most common optical sights and other equipment can be mounted on. None of the above mentioned or other pieces of equipment attached to the weapon will conflict with handling or stripping. Safeties, magazine catch, wire stock catch, etc., can easily be operated without changing grip by either left- or right handed shooters. 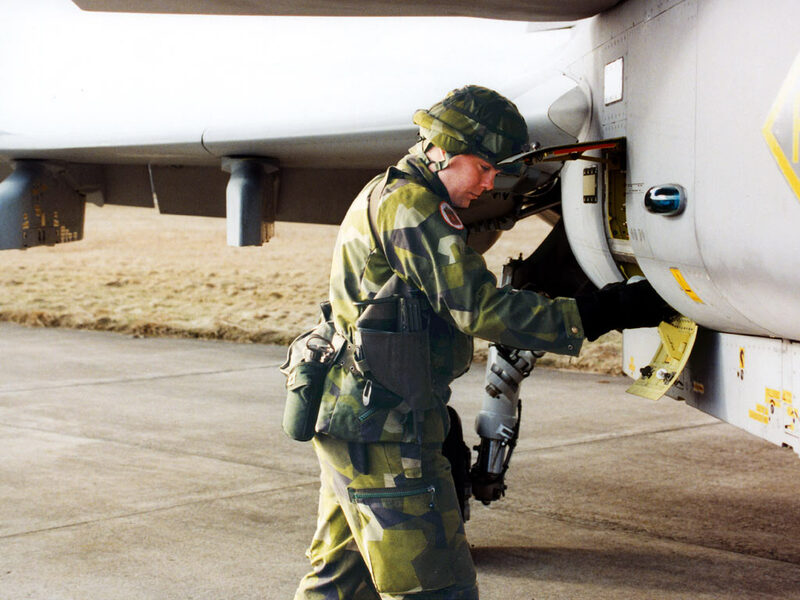 The uniquely designed bolt handle is easily operated by the supporting hand (left or right) without the risk of losing the grip, even when thick gloves are worn. The magazine capacities are 20, 30 and 100 rounds. The 20 round magazine ends in line with the pistol grip. An extra magazine can be inserted into the front grip to increase reloading speed.